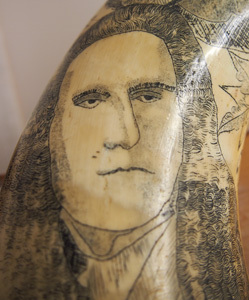 These scrimshaw bullock horns were etched by Dennis Gunn who was awaiting execution at Auckland Prison in the first half of the 20th century. 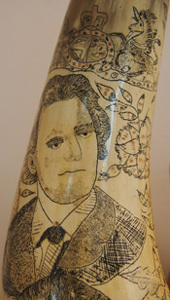 Before he went to his death he gave the horns to his jail warden, Mr Nicholls. 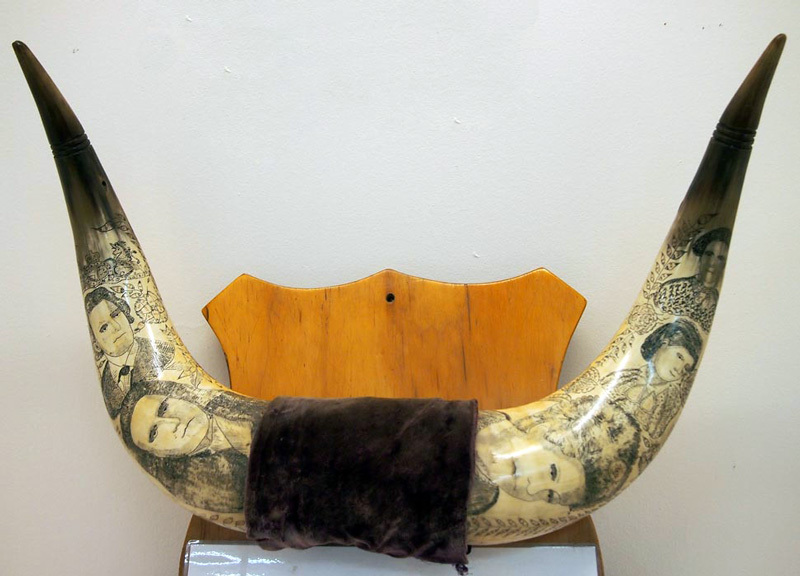 Mr Nicholls kept the horns, and when he retired to Mokau he donated them to the Mokau Museum. 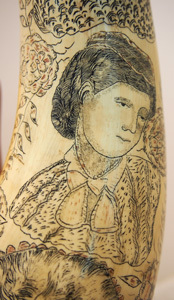 The beautiful etching is known as scrimshaw, and is achieved when fine etching is rubbed with ink or ash to make the lines show up. The portraits on the left horn show the prisoner’s judge and lawyer, and on the right horn show his mother and two sisters. 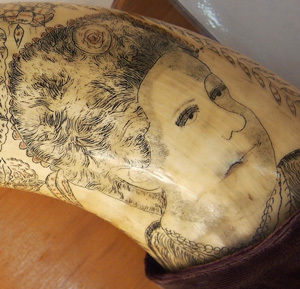 These horns are rare and valuable, not just for the fact that they are a pair but also for their fine craft and the poignant story of their creation. 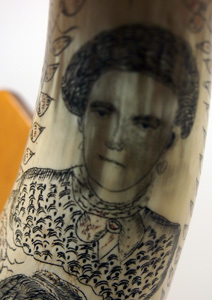 Research suggests that these horns were carved by Dennis Gunn, who was accused of the murder of Augustus Braithwaite in 1920. 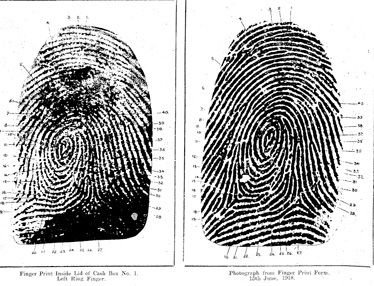 Gunn was the first man ever to be executed in New Zealand almost entirely on finger print evidence. Tragically, it is believed by many that Gunn was wrongfully executed and that the murder was committed by his brother-in-law. The robbery and murder were committed in Auckland on Saturday the 13th of March 1920. The Postmaster, Augustus Braithwaite, was shot, killed and robbed of his post office keys in his home. Three men then robbed the cash boxes in the Ponsonby Post Office. Gunn was not a suspect until his fingerprints were found on the cash boxes at the scene. A bag full of bullets, three guns and the post office keys bearing Gunn’s fingerprints were also discovered near his home. Gunn confessed to the robbery but not the shooting. Gunn stated that the person who committed the murder wore gloves. 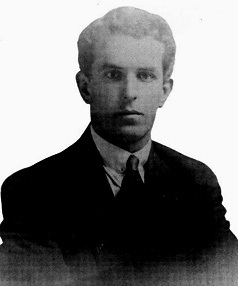 Dennis Gunn was hanged in Mt Eden Prison on June 22nd 1920, just 40 days after the murder occurred. The descendants of Gunn have said it was his brother-in-law who killed Braithwaite. Soon after Gunn’s execution his brother-in-law fled to Taumarunui and committed suicide. Gunn rests at Waikumete Cemetery in Auckland. His tombstone reads “In Loving Memory of Dennis Gunn – Sadly Wronged”.